"Tax reforms have caused economic shocks among the ranks of the poor, and this was foreseen.... Knowing that the poor will be most affected, DSWD lost no time in putting together the implementing guidelines of the UCT (unconditional cash transfer) so that the cash grants can be provided as soon as possible," DSWD OIC Secretary Emmanuel Leyco said. The UCT is a program of the DSWD to shield the poorest families from the effects of the Tax Reform for Acceleration and Inclusion (Train) Law. 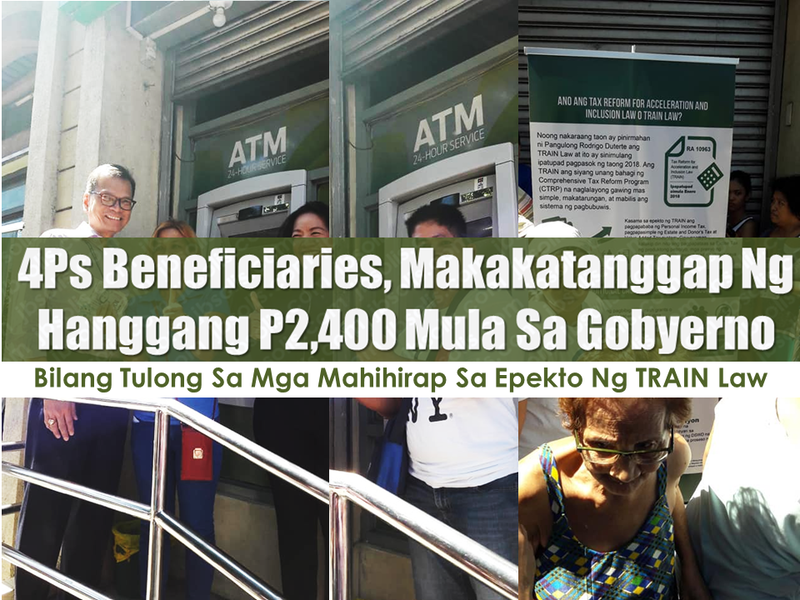 Pantawid Pamilyang Pilipino Program (4Ps) beneficiaries will receive as much as P2,400 from the Department of Social Welfare and Development (DSWD) under a program seeking to offset the effects of the TRAIN law. On March 5, some P4.3 billion was released to the Land Bank of the Philippines (LBP) for 1.8 million 4Ps beneficiaries with existing LBP cash cards. For 2018, each beneficiary will receive P200 per month. In 2019 and 2020, the subsidy will increase to P300 monthly. The LBP released cash grants to almost 420,000 beneficiaries from Metro Manila, Ilocos Region, Cagayan Valley, and the Cordillera Administrative Region. The Landbank of the Philippines has set-up mobile ATM Machine in front of the Department of Social Welfare and Development office. DSWD said that instead of giving the P200/monthly, they decided to give the UCT to its beneficiaries for one year which amounts to P2400. The UCT is on top of 4Ps beneficiaries' regular cash grant and P600 rice subsidy from the program.